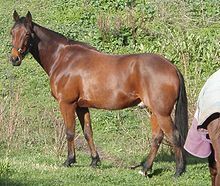 Standardbreds tend to be more muscled and longer bodied than the Thoroughbred. They also are of more placid dispositions, as suits horses whose races involve more strategy and more changes of speed than do Thoroughbred races. Standardbreds are considered people-oriented, easy-to-train horses. They are generally a bit heavier in build than their Thoroughbred cousins, but have refined, solid legs and powerful shoulders and hindquarters. Standardbreds have a wide range of height, from 14.1 to 17 hands (57"-66"), and most often are bay or the darker variation of bay called "brown", although other colors such as chestnut and black are not uncommon. Gray and roan are also found. The tobiano pattern is seen in some New Zealand-bred horses. There are two basic types, trotters and pacers. As the name suggests, the trotter's preferred racing gait is the trot, where the horses' legs move in diagonal pairs, when the right foreleg moves forward so does the left hind leg, and vice versa. The pace is a two beat lateral gait; Pacers' forelegs move in unison with the hind legs on the same side. However, the breed also is able to perform all other horse gaits, including the canter, and pacers can be retrained to trot.